Caught this on Juan Cole’s Informed Comment this morning. It’s hard to know what to do in the current political and environmental environment. Scanned a piece today on Climate and Capitalism website. 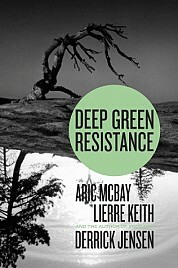 This piece was a reaction to a favorable review of Derrick Jensen’s book Deep Green Resistance that ran on Canadian Dimension. Jensen seems to catch a lot of reactionary ink to his proposals to create change. I am pretty busy working the create change in many ways, so don’t have lots of time to read Jensen (or to blog these days) but I get the impression that Jensen embraces a Luddite sensibility at times. Maybe also a monkey wrench mentality that is attractive, but may be a dead end politically. There is something about the monkey wrench mentality that I find both sexist and adolescent, which is not to say that I don’t also find it attractive. That elitist, greener-than-thou attitude permeates Deep Green Resistance. There is something afoot in the world that makes it difficult to rouse the peasants. It seems to me to be a strange mix of economic desperation brought on by wage stagnation, by labor outsourcing, by globalization of corporate profit and human exploitation combined with a media and consumption induced trance state where folks who are clinging to creature comforts and their hope of individual job security blinds them to the fact that the ground is shifting under our feet. Our pensions, 401k benefits, Medicare, Social Security – none of this will be protected if we destroy the planet’s willingness to accommodate our species. It may be difficult to see that hard reality with your head firmly planted in the sand of Fox News, or Time Warner, or any of the media giants who all spew a steady stream of distraction and infotainment. Ah, yes. A sacred dwelling in a place we cannot own. I will cut stone by hand on that project. See you at the quarry.